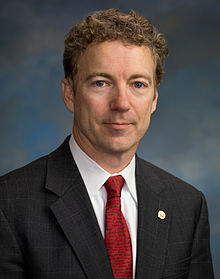 Rand Paul (born January 7, 1963) is an American politician. He is the United States Senator from Kentucky. He is a Republican and the son of Ron Paul. Paul is a member of the Tea Party movement. Paul was sworn in on January 5, 2011, along with his father, who simultaneously served in the House of Representatives. Rand was assigned to serve on the Energy and Natural Resources, Health, Education, Labor and Pensions, Homeland Security and Government Affairs, and Small Business committees. Paul also formed the Senate Tea Party Caucus. For the 113th Congress, Paul was added to the Foreign Relations committee and retained his spot on the Health, Education, Labor and Pensions, Homeland Security and Government Affairs, and Small Business committees. On March 6–7, 2013, Paul engaged in a filibuster to delay voting on the nomination of John O. Brennan as the Director of the CIA. Paul questioned the Obama administration's use of drones and the stated legal justification for their potential use within the United States. Paul held the floor for 12 hours and 52 minutes. In the beginning of 2015, Senator Paul re-introduced the Federal Reserve Transparency Act. Senator Paul also introduced the FAIR Act, or Fifth Amendment Integrity Restoration Act, which would restrict civil forfeiture proceedings. On May 20, 2015, Paul spoke for ten and a half hours in opposition to the reauthorization of Section 215 of the Patriot Act. Sections of the Patriot Act were prevented from being reauthorized on 1 June. Paul officially announced his candidacy for the 2016 U.S. presidential election on April 7, 2015. He dropped out of the race on February 3, 2016. His run to be the president only received 1 delegate. His campaign was under the Republican Party. Paul married Kelley Ashby in 1990. Together, they have three children. On November 3, 2017, Paul was assaulted in his home by his 59-year old neighbor. The neighbor was arrested by state troopers, and was subsequently charged with one count of 4th degree assault. Although initial announcements stated that Paul had only minor injuries, subsequent news reports explained that he sustained five broken ribs. ↑ "About Rand Paul". Rand Paul for U.S. Senate. Retrieved October 23, 2010. ↑ Fineman, Howard (12 July 2013). "Rand Paul Torn Between Tea Party Fire, White House Dreams" – via Huff Post. ↑ Douglas, William (January 5, 2011). "Father watches with pride as Rand Paul becomes U.S. senator". The McClatchy Company. Retrieved January 29, 2011. ↑ "Four committee assignments for Rand Paul". Lexington Herald-Leader. January 28, 2011. Retrieved January 29, 2011. ↑ McCarthy, Daniel (January 3, 2013). "Rand Paul on the Foreign Relations Committee — and What It Means". The American Conservative. Retrieved March 29, 2013. ↑ Josh Voorhees (March 7, 2013). "Rand Paul Ends Epic Mr. Smith-Style Filibuster After More Than 12 Hours". Slate. Retrieved March 7, 2013. ↑ "Sen. Paul Proposes an Audit of the Federal Reserve". Rand PAC. January 28, 2015. Retrieved February 4, 2015. ↑ "Sen. Rand Paul Introduces the FAIR Act". Rand PAC. January 27, 2015. Retrieved February 4, 2015. ↑ Kim, Seung Min; Byers, Alex. "Rand Paul calls it a night after 10 1/2 hours". Politico. Politico. Retrieved 21 May 2015. ↑ "Rand Paul seizes political moment with NSA protest". CNN. 22 May 2015. ↑ "NSA reform advances as Senate moves to vote on USA Freedom Act – as it happened". Guardian. ↑ Camia, Catalina (April 7, 2015). "Rand Paul announces presidential run". USA today. Retrieved April 7, 2015. ↑ "Kentucky Sen. Rand Paul quits 2016 GOP presidential race". Associated Press. February 3, 2016. Retrieved February 3, 2016. ↑ McCausland, Phil (November 5, 2017). "Sen. Rand Paul Suffers Minor Injury After Being Tackled by Neighbor, Police Say". NBC News. Retrieved November 5, 2017. ↑ Gee, Brandon; O'Keefe, Ed (November 5, 2017). "Sen. Rand Paul's injuries far more severe than initially thought". Washington Post. Retrieved November 5, 2017. Wikimedia Commons has media related to Rand Paul.